Elect to Adopt Liam and Dune This Weekend! – Paws & Claws Adoptions Inc. 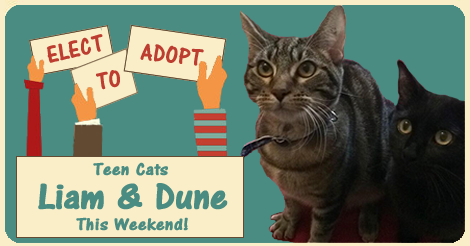 Elect to Adopt Liam and Dune This Weekend! Liam is a friendly and loving 7 month old boy, who is always keen on getting lots of pats. He can get very playful and loves running behind curtains and scaring Dune. Dune is a 8 month old girl who is shy and quiet at first, but with time and patience she enjoys a good pat and purrs like a machine when she’s getting attention. Dune loves playing with anything that dangles, especially tassels and trying to chase Liam’s tail. Liam and Dune have been desexed, vaccinated, microchipped, flea and wormed treated and are ready to go to their new fur-ever home together for $180.